It’s not just the beard. If you want to see the spirit of Christmas during the 2015 season, tell Houston fans to check out this guy. Scratch that. 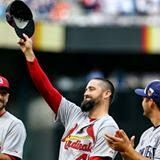 Free agent acquisition Pat Neshek is Christmas every day of the year. Guaranteed, the Astros will have a league leader in “most autographs given” and “best signature” categories.